Cruise aboard the magnificent Amacello, October 3, 2019 with Alistair and Aron Veen. Alistair Veen is an award-winning Sommelier and top restauranteur in Surrey, British Columbia. He and his wife Aron are the consummate hosts and owners of Tap Restaurant. In the fall of 2019, they will extend their warm and gracious hospitality and rich expertise, creating a wine tour of a lifetime to the South of France. This spectacular tour is layered with many special touches including private tastings, farm to table market excursions and much more. Space is limited, inquire today! ASK FOR PRE OR POST CRUISE LAND PROGRAM: 7-Night Cruise with 3-Nights Paris pre-cruise and 3-Nights Barcelona post-cruise. From romantic cities to foodie havens and artistic epicenters, this itinerary enlivens all your senses. Starting from Lyon, France’s culinary capital, savor the beauty of legendary vineyards and imbibe in local vintages like Beaujolais and Côtes du Rhône. Enjoy hunting for truffles, refining your Provençal cooking skills, and learning how to pair chocolate with wine. Trace the steps of famous artists in Arles and Avignon and be inspired! Culinary, Wine & Travel Experts! Travel with them to the Rhone Valley in October 2019! Alistair's culinary journey began at the age of 15 when he took on his first job cooking at a restaurant. A few years later, he used his culinary skills to help pay his way through university.It soon became clear though that his love for cooking had surpassed his desire for a chemical engineering degree. He formalized his culinary training, earning the top spot in his Red Seal Chef class. As a teenager, Aron developed a love of restaurant life and after high school she completed VCC’s Hospitality Management Diploma. Alistair and Aron met in their early 20s at Earls on Robson Street where Aron was the day manager and Alistair was the executive chef. Their love for food, wine, and each other grew quickly, and after a tour of duty at corporate downtown restaurants, they had an opportunity to buy Tap Restaurant in 2006. They moved to South Surrey and fell in love with their new community and its budding food scene. Alistair and Aron married in 2010 and spent their honeymoon travelling the regions of Champagne, Alsace and Burgundy, cementing their shared interest in food and wine. Alistair is not only the owner and Executive Chef at Tap, he also serves as the restaurant’s Sommelier. Aron and Alistair completed ISG 1 + 2 and WSET Level Three together. Then while Aron was busy raising babies (- their son is currently 3.5 years and their daughter is 2 -), Alistair furthered his education by completing the first Court of Master Sommeliers (CMS) course (earning the Champagne award along the way) and successfully challenging the certified exam the following day. In 2015 Alistair's exceptional wine knowledge led to him being named Best Sommelier of BC by the Canadian Association of Professional Sommeliers, BC Chapter. Alistair earned distinction in the French Wine Scholar program and became one of the 5% of candidates to pass the Court of Master Sommeliers Advanced certification on his first try. In 2017 he competed at the National Sommelier Competition in French. He will write the Master Sommelier certification in July 2019 and has hopes to challenge the CCC Gold Seal culinary program as well. Aron is now back at the restaurant working as the Events + Catering Coordinator for the private dining room. They continue to have plenty on their plate at Tap, including discovering exceptional wines from regions around the world and developing cuisine that pairs divinely with their cellar selections. They are very excited to blend their love of travel, wine and food and share amazing adventures with their customers! 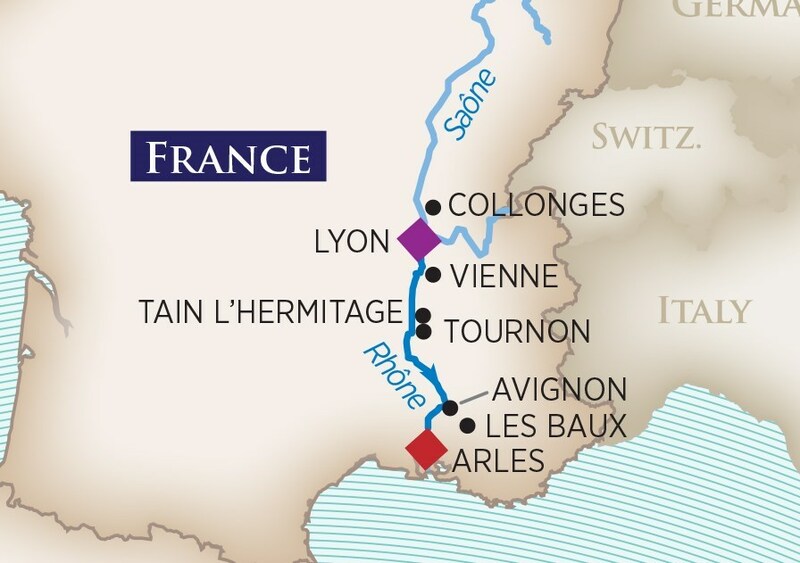 They hope you can join them as Tap travels to the Rhone Valley in October 2019. All rates are per person for cruise only, based on double occupancy in an entry level category stateroom unless stated otherwise. Offer is valid on select sailings only and applicable to new bookings only. Unless explicitly stated that single supplement is waived, solo travelers in a double occupancy stateroom must pay an additional single supplement amount before receiving any discounts. Ask about Solo Traveler promotions. Offer is not combinable with any other promotions/discounts, limited to availability, capacity controlled and subject to change or termination without notice. Port charges, land programs and round-trip airfare are not included in cruise price. Other restrictions apply.